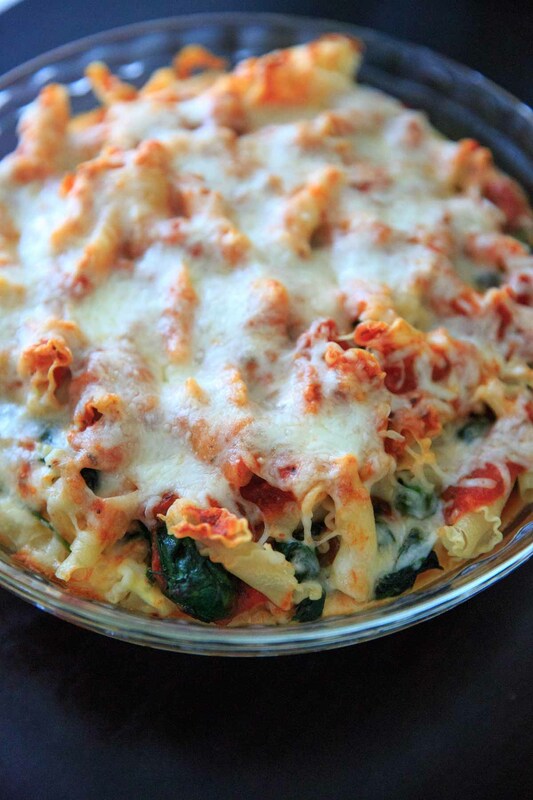 Spinach Baked Ziti Recipe – A meatless pasta casserole with greens that is sure to be a family favorite! Adapted from my grandma’s baked ziti recipe and scaled down to 4 (generous) servings. 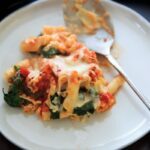 If you’ve followed the blog a while, you have probably heard me mention grandma’s baked ziti once or twice. That used to be my absolute go-to meal when I had people over, especially before I started the blog and didn’t really have confidence in cooking. It’s the #1 all-time most visited recipe on the blog, so I think you guys like it too. So this time I added in a few greens and I scaled it down so it feeds about half of the army that the original recipe serves. Don’t skimp on the fat in the ricotta cheese. I know it’s tempting to get fat-free or low-fat ricotta, but it really just doesn’t taste the same. Mix it up with seasonings. Sauteing your spinach with garlic is a good way to add some flavor to the greens. At a minimum I like to top it with some salt and dried Italian seasoning (or basil or oregano). Make it even heartier with flavored marinara sauce. Mushroom or cheese sauce would be a great option, or make your own marinara to customize as you prefer. It doesn’t have to be ziti pasta (!) 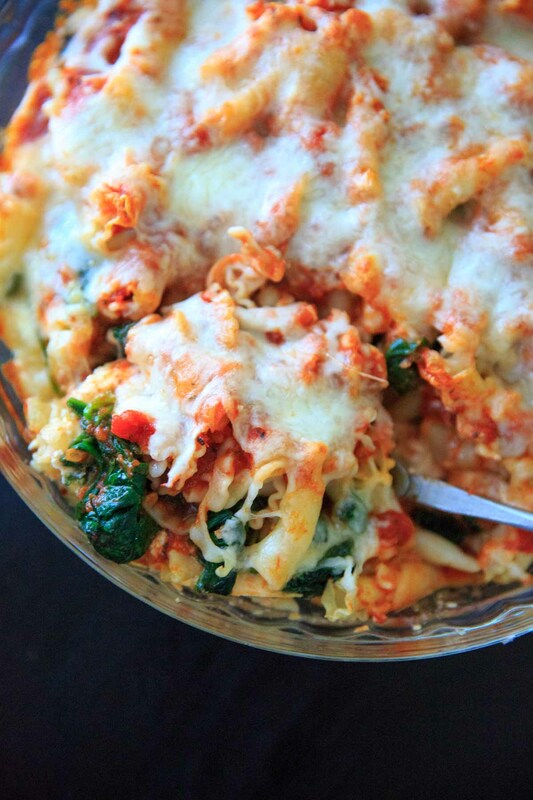 If you are a pasta connoisseur you may have noticed these pictures aren’t actually ziti! The pasta used in the photographs is called gigli, or campanelle, which means “little bells.” Any tubed or similar-shaped pasta would work here. 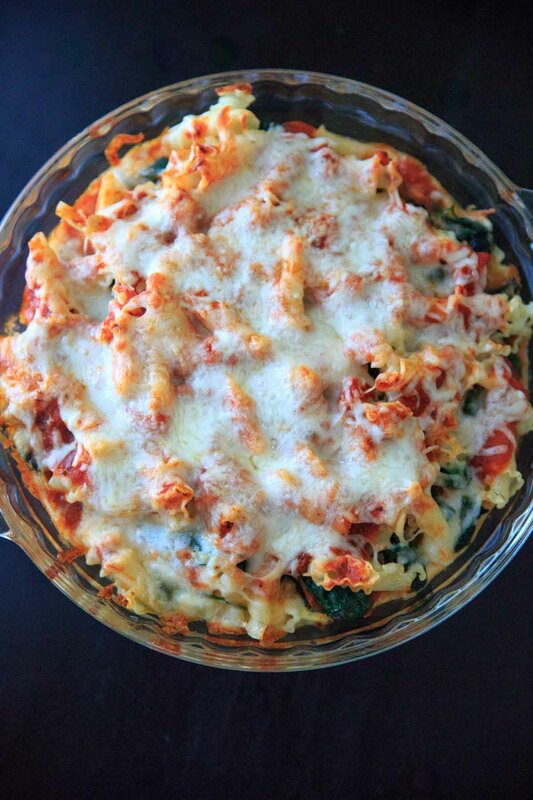 Spinach Baked Ziti Recipe - A meatless pasta casserole with greens that is sure to be a family favorite! 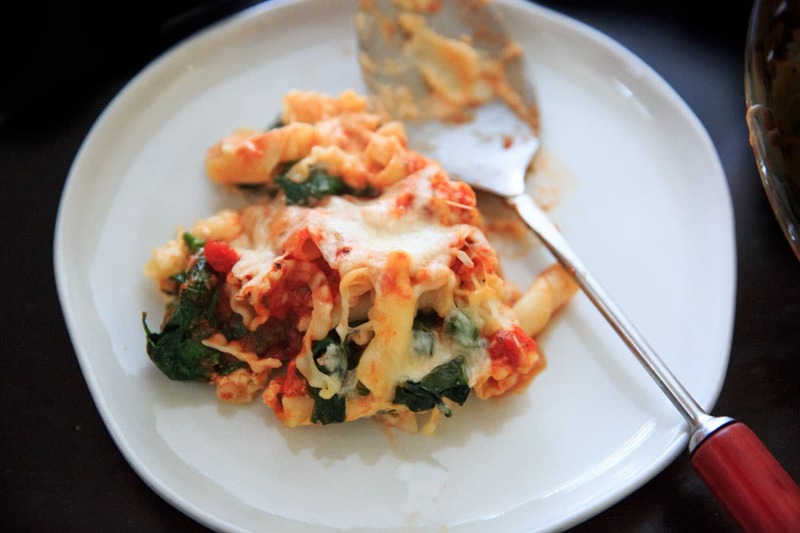 Adapted from my grandma's baked ziti recipe and scaled down to 4 (generous) servings. Cook the pasta according to package instructions. 2 1/2 - 3 cups uncooked ziti should make about 4 cups cooked. Set aside. Meanwhile, for the spinach: heat oil over medium heat in stove pot. Add garlic if using, and add spinach until cooked down. Remove from heat and top with salt and seasoning as desired. Set aside. In a medium bowl, combine ricotta cheese, eggs, and 1 cup of the mozzarella cheese. 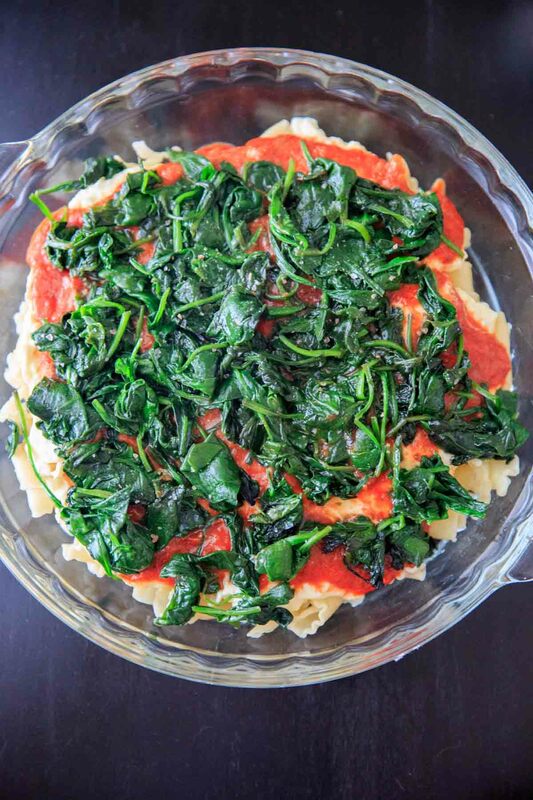 In an 8 or 9 inch baking dish, layer ingredients as follows: half of the cooked pasta (2 cups), half of the marinara sauce (3/4 cup), all of the ricotta mixture, all of the cooked spinach, remaining 2 cups pasta, remaining 3/4 cup marinara sauce, remaining 1 cup mozzarella cheese. Bake at 350°F for 35-45 minutes or until cheese is melted and lightly browned.